TS EAMCET Syllabus (तेलंगाना ईएएमसीईटी सिलेबस, परीक्षा पैटर्न) 2017: Applicants who are going to appear in the Telangana Engineering Entrance Exam are advised to check the latest and updated Syllabus of TS EAMCET in practice to score qualifying marks in TS engineering entrance exam. Candidates will also be able to check the TS EAMCET Exam Pattern 2017. If we talk about the syllabus and exam pattern then we want to conclude that the questions will be asked from 11th & 12th syllabus of Physics, Chemistry, and Mathematics. There are total 160 questions ( Maths: 80, Physics: 40, Chemistry: 40) and each question carries one mark. Candidates are advised to check the detailed Telangana EAMCET Exam Pattern, Syllabus 2017 by following the complete information given below. 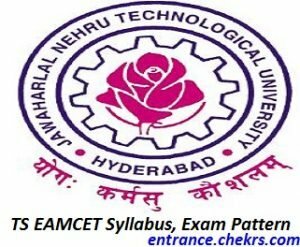 To score good marks in entrance examination applicants need to go through the topic wise Syllabus and examination paper pattern of TS EAMCET. Telangana State Engineering Entrance Test is conducting by the Jawaharlal Nehru Technological University (JNTU), Hyderabad for admission to undergraduate applicants. The questions that are asked in the TS EAMCET 2017 will be from the PCM 10+2 level of the CBSE/ state board exam. This examination is State Level exam for undergraduate applicants admission. With the help of Telangana EAMCET Syllabus 2017, applicants we will be able to score good and qualifying marks in entrance examination. Following are the subject topics of Telangana State Engineering Entrance Test which is given as follow. We are here to make the candidates aware of the Exam Pattern of Telangana EAMCET 2017 and after knowing of the paper pattern, candidates will be able to become familiar with the type and number of questions that are asked from different sections. There are total 160 questions (M:C:P = 80:40:40) and the maximum marks that can be achieved are 160 with each question carrying 01 marks. No marks will be deducted for any wrong attempted question. Paper Type: Objective type (MCQ). Paper Duration: 03 Hours, i.e. 180 Minutes. Total No. of questions: 160 Questions. Paper Language: English and Telugu. Its a great news for all those candidates who are searching for the study material to prepare themselves for Telangana EAMCET 2017. They will be able to check subject wise syllabus of TS EAMCET 2017 from the details given above The questions that are included in Telangana EAMCET Syllabus 2017 are from the 10+2 level questions of Physics, Chemistry, and Maths. If we talk about thwTS EAMCET Exam Pattern 2017 then we want to conclude that there are total 160 questions (P:C:M = 40:40:80) that are asked in the entrance exam. Each correct answer carries 01 marks and there will be no negative marking. Still, if you have any of the queries, you are invited to contact us by commenting at the end of the post. We will respond you as soon as possible with the most optimal solutions.